My coworkers and I share a small refrigerator in the hallway that adjoins our offices. It’s a handy place for us to store our lunches because we’re often too busy (or lazy) to walk the two flights stairs to the main kitchen in our office building. One morning a few weeks ago we all noticed a delicious garlicky aroma coming from the refrigerator every time it was opened. By mid morning I had to satisfy my curiosity to figure out who’s lunch was smelling so good and what exactly it was. As it turns out, a colleague of mine had made a Weight Watchers recipe for spaghetti squash tossed with fresh tomatoes, garlic, and basil. It looked and smelled so delicious that it inspired me to come up with this very similar recipe prepared just a bit differently and flavored with rosemary instead of basil. favorite summertime go-to recipes is a fresh tomato bruschetta that is flavored with nothing but fresh rosemary, garlic, salt, pepper, and olive oil. By borrowing these same great flavors from my bruschetta recipe and combining them with the spaghetti squash, I was able to capture the essence and freshness of the bruschetta while avoiding the calories from the bread. *I used the last of my heirloom tomatoes from my garden, but I think fresh plum tomatoes would world well also. In a food processor combine 1 cup of the chopped tomatoes, the rosemary, garlic, red pepper flakes, ½ teaspoon salt, and olive oil. Puree until smooth. 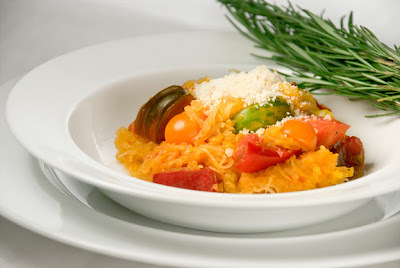 In a large bowl combine the spaghetti squash, chopped tomatoes, and tomato puree. Taste and add additional salt to taste. Serve warm or at room temperature with a sprinkle of freshly grated parmigiano reggiano cheese. Yeah, I made your blog :-) and agree that it is about being lazy (ha-ha). This looks so delicious! What a perfect fall dish. I made this last night and it was so delicious!